Even if you have a large bathroom that has plenty of room for a remodeling project, you may not exactly have the cash to make your design dreams come true. 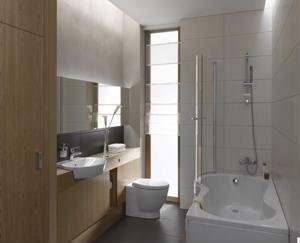 The bathroom can be one of the most expensive areas of a home to renovate, which can be difficult if you're on a budget. However, HGTV says there are a few ways you can cut back and give your bathroom a fresh new look. First, don't be afraid to look for a vanity or bath tub online, rather than at a large home improvement store or expensive bathroom retailer. There are a number of top quality fixtures that you can find online through websites, such as eBay, that can help you while you're working on a budget. Next, choose one item to splurge on and go for more affordable fixtures when it comes to the rest. For instance, you might have your eye on an expensive bath tub to make your bathroom complete. Buy it, then ration the rest of your funds accordingly to make sure that the job gets done. Finally, go for large tiles throughout your bathroom. Not only are these more cost-effective, but they can create an artsy look. In the end, you'll be surprised at what you can do on a budget.